Stanisław Herman Lem ( listen (help·info)) (September 12, 1921 – March 27, 2006) was a Polish science fiction writer. His writings are highly philosophical and satirical. His books have been translated into 41 languages. Over 27 million copies of his books have been sold worldwide. At one point he was among the most widely read science fiction authors in the world. Lem's writing is full of intelligent humor, puns, and neologisms, and Michael Kandel's translations into English have been praised by many for capturing Lem's style. Lem is perhaps best known for his novel Solaris. This novel was published in 1961. It is set into the future. Humans have discovered what they think is intelligent life in space. They want to talk to the alien life form. The only problem they have is that the life form is the size of a planet. It is an ocean. This book has also been made into a film by Andrei Tarkowski in 1972. Steven Soderbergh made another film of the book in 2002. Lem won various prizes for his novels. 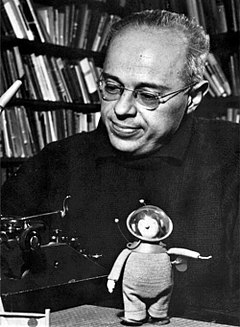 ↑ "Stanislaw Lem - Obituaries - News". The Independent. 2006-03-31. Retrieved 2014-02-10. This page was last changed on 19 March 2019, at 10:50.